Iowa State kept it close for a half, but turnovers and penalties spoiled the Cyclones chances for a victory against the #19 Oklahoma State Cowboys. 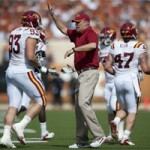 Iowa State fell to the Texas Longhorns by the narrowest of margins last Thursday night. Aaron Wimberly had another great game for the Cyclones with 140 total yards and two touchdowns. Iowa State had a disappointing start to the 2013 Football Season with a loss to the Northern Iowa Panthers. 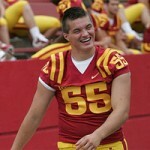 Check out some photos from the game. 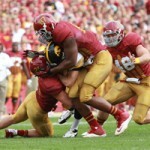 The Iowa State Cyclones fell in Austin to the Texas Longhorns by the score of 33-7. Quenton Bundrage’s 14 yard touchdown reception was the only score for ISU. Landry Jones threw for four touchdowns and 405 yards in the Sooners 35-20 victory over the Cyclones. Durrell Givens had 10 tackles and 2 interceptions to lead Iowa State. The Iowa State Cyclones scored 10 first quarter points, but never scored again in a 31-10 loss to the Oklahoma State Cowboys. 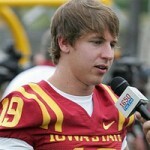 Will this be the year that ISU’s offense starts clicking on all cylinders? Check out our offensive statistics projections for 2011.